When: Beginning October 2, 2018, EVERY TUESDAY through the end of the school year (except for those days that school is closed), from 3:30 p.m. to 5:00 p.m.
How: Just show up! You do not need to pre-register to attend, however you must sign a behavior contract and have your parent fill out the permission form. 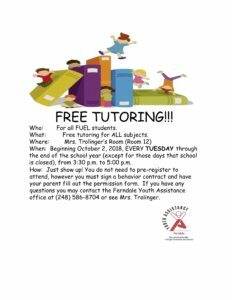 If you have any questions you may contact the Ferndale Youth Assistance office at (248) 586-8704 or see Mrs. Trolinger. Copyright © 2019 Ferndale Youth Assistance. All rights reserved.